This large map of Morrowind (precisely - Vvardenfell District of Morrowind) is intended both for diplomacy and strategic games - ffa and team games. There are 2 councils on the map. Each consists of 3 seats. There is a system of antibonuses that prevents getting income from more than 1 seat of any council. Not all of those antibonuses are shown on the map. The general rule is this: no matter what combination of seats you hold, you always get only one positive bonus - the biggest among the ones you have. Notice that the central region (house Dagoth) is connected to the rest of the map through only 2 territories - one in the south, one in the north. Review by Nathan on 3/26/2018. I greatly enjoyed playing on the other Morrowind map, and this one is no different. It is a bit easier to wrap one's head around, so that's a positive. 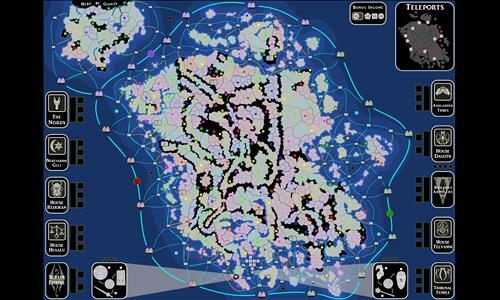 It provides a similar level of strategic challenge as there are just so many connections, bottlenecks and varied bonuses. It is a great work. I did find a missing connection between Anudnabia and Darothril in the eastern Tevlanni islands. Also, House Dagoth is a sufficiently isolated as to create a bit of imbalance. Perhaps connecting the two almost-connections in its SE and NW would help. Thank you for the review, Nathan! I'll fix the broken connection immediately. As for the isolation of house Dagoth - it is a lore-based thing. The Ghostfence was built around the central mountain to isolate house Dagoth - and only 2 ways on the mountain were left. So I decided to stick to the lore here. Secondly, there are similar regions on other maps - most part of the "beyond the wall" region of Limalia's Westeros map is connected with the rest of the map through a 1-territory bottleneck. Here house Dagoth has 2 connections, which is twice as many! So I prefer to view it as a feature, not as a bug :) But now I think that I should include a note about house Dagoth into the map description. Thank you for your kind review. It is great that there is Nathan, who always responds to new maps! Review by A_B3 on 3/31/2018. Huge and a variety of different strategy elements make for a great game. Well done. Thanks, A_B3! I'm glad that you liked it! Review by PsychoCat on 4/4/2018. Review by warhawk on 5/16/2018. Loved the "transporters and the Ships.